TedLipien.com, Truckee, CA, March 1, 2011 — In this series of analyses for Free Media Online (FreeMediaOnline.org) — U.S. International Broadcasting in Crisis— Ted Lipien, former Voice of America acting associate director, examines recent Broadcasting Board of Governors’ decisions, with a focus on the latest controversial plan to completely eliminate Voice of America on-the-air radio broadcasts to China. While officials of the Broadcasting Board of Governors (BBG) tell members of Congress that shortwave radio in China is dead and announce plans to terminate all Voice of America shortwave broadcasts to China in Cantonese and Mandarin, California-based Sound of Hope Radio (SOH) has announced plans to expand its shortwave programs targeting Mainland China, The Epoch Times newspaper reported. Sound of Hope Bucks the Trend and Expands Broadcasts to China |Â Read The Epoch Times article in Chinese. The article cites political reasons (autocratic rule, censorship,Â hacking and blocking of the Internet, no free press to defend rights of citizens)Â and market research data (750 million without Internet access, extensive use of shortwave by China National Radio, ability to reach 230 million migrant population)Â used by Sound of Hope RadioÂ to justifyÂ its decision on expanding shortwave radio while VOA and BBC are moving in the opposite direction. Free Media Online (FreeMediaOnline.org), a California-based media freedom NGO, reported that the reasons given by Sound of Hope for expanding shortwave news broadcasting to China stand in sharp contrast with the information being provided to Congress and American public by BBG officials who want to end such broadcasts in favor of increased presence on the Internet. With a recent addition of 4.5 hours, Sound of Hope Radio broadcasts daily on average 20 hours of shortwave programming to China. While members of Congress are getting one side of the story from BBG executives eager to end Voice of America radio to China in favor of Internet-only VOA news delivery, Allen Zeng cites audience research data in support of Sound of Hope Radio strategy for China which contradicts some of their claims. Pointing out that during the recent pro-democracy demonstrations in Egypt, the regime was able to censor the Internet, Mr. Zeng said that his radio network relies on a number of program delivery channels. The threat of the Chinese authorities censoring, hacking, and blocking the Internet has been one of the strongest arguments of the critics of the BBG’s decision to end all on-the-air Chinese radio broadcasts by the Voice of America as of October 1, 2011, which happens to be the national holiday of communist China. Free Media Online president Ted Lipien said that “being officials of a U.S. government Â agency charged by Congress with understanding and serving information needs ofÂ audiences inÂ nations abroad, BBG executive staff has shown remarkable political parochialism and insensitivity in choosing the birthday of communist China to end decades of Voice of AmericaÂ broadcasts. These broadcasts are bringing uncensored information, hope, and message of human rights to millions of Chinese living without democracy under authoritarian rule. Ending them weakens America’s prestige, influence, and support for human rights,” Ted Lipien said. Last week, Free Media Online and others reported that the Voice of America websites were attacked by a group calling itself the Iranian Cyber Army, which managed to redirect VOAÂ web traffic to its own website showing an Iranian flag, a gun, and an anti-American message. Also in 2009, the Voice of America websites came under a successful cyber attack and were unavailable for more than two days while President Obama was making his first official visit to Russia. Ted Lipien said that “we can be certain there will be no uncensored Internet in China if there is another Tienanmem just as there is no uncensored Internet in China now. While expanding Internet presence is highly desirable, we must not forget 750 million Chinese who are not using the Internet, millions of those who will not open VOA and RFA websites for fear of being monitored by the secret police, and those who can’t find them because the Chinese authorities redirect traffic away from these websites. Listening to radio is private and safe, and while the Chinese government can jam shortwave transmissions, some of them can always get through, just as they did during the Cold War,” Ted Lipien said. To justify their decision to end VOA radio to China, BBG officials have been telling members of Congress that, according to their sponsored research, shortwave listenership in China is practically non-existent, insisting that only 0.4 percent of Chinese survey respondents reported listening to any shortwave radio broadcasts in the previous week. In the article on Sound of Hope Radio, The Epoch Times reported, however, that due to China’s size, even China National Radio uses over 80 shortwave frequencies to achieve nationwide radio coverage, a proof that unlike BBG officials the Chinese authorities themselves don’t see shortwave as a dead medium. Free Media Online analysts suspect that either China-based firms doing market research for the BBG are under the influence of the Chinese authorities or Chinese respondents are reluctant to tell strangers that they listen to shortwave radio, as this may indicate to the authorities thatÂ these individualsÂ are listening to foreign broadcasts. It is highly doubtful that the Chinese government would use over 80 shortwave frequencies to reach 0.4 percent of the population. One proof that the BBG-sponsored research may be either manipulated by the Chinese authorities or responses may be influenced by the fear of the government can be found in the claims of BBG officials to members of Congress that their recent surveys indicate past-week usage of shortwave in China at 1.1 percent in urban areas, where — as they like to point out –Â Internet use is exploding, vs. 0.4 percent in rural areas. One would suspect that rural residents, whom even China National Radio targets with shortwave broadcasts, would be much more fearful of the local authorities and would not provide a truthful answer even if they are shortwave radio listeners, to either domestic or foreign broadcasts. Even some of the BBG’s own mid-level analysts do not believe in these figures. 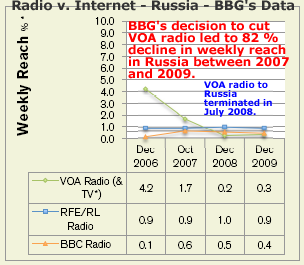 But top level BBG officials made similar claims based on faulty data to justify ending Voice of America radio broadcasts to Russia in 2008 and promised greatly expanded audience reach for VOA on the Internet. However, by the end of 2009, their Internet audience reach in Russia stood at 0.1%, while their overall media reach declined by more than 80%, all of it due to going off-the-air with radio broadcasts to Russia. Free Media Online has been warning that BBG officials want to repeat the same mistake in China. BBG officials point out that Radio Free Asia, which they also manage, will continue with shortwave broadcasts to China, but even their own data shows that now the Voice of America has much larger radio audience and greater name recognition among the Chinese. The Epoch Times article gives the number of radio sets in China at 500 million and points out that foreign shortwave broadcasts have long been the source of reliable information for theÂ Chinese people. The article goes on to say that shortwave broadcasts were the only way the people in China received true information during the June 4 crackdown of the democracy movement at the Tienanmem Square in 1989. Sound of Hope Radio website says that the media network is providing an alternative to Chinaâ€™s state controlled media with news and cultural programming and is seeking to pierce the barrier of state censorship through large-scale shortwave radio broadcasting directly to a majority of the Mainland Chinese population. Mr. Zeng told The Epoch Times that SOH has systemically invested in expanding shortwave broadcasts to China and now ranks fourth after VOA, Radio Free Asia and Radio Taiwan International among radio stations broadcasting to China from abroad. The network calls itself the largest private broadcaster to China, producing over 20 thousand radio programs each year. According to SOH, many Chinese already listen to short wave radio and others could purchase this technology cheaply and easily, while the Internet is both expensive and available to only one-third of the population of China. According to The Epoch Times, Allen Zeng justified increasing SOH shortwave broadcasts to China instead of decreasing them by pointing out that China is still ruled by a totalitarian regime and lacks free press that could protect the rights of the Chinese people. “They are truly in need of freedom of information, yet the Internet can only be accessed by one-third of the people,” Mr. Zeng said. The Epoch Times article provides statistical data from the China Internet Network Information Center which show that China has 450 million Internet users and 730 million adult non-Internet users. While BBG officials tell individual members of Congress about the growth of the Internet in China and the 450 million Internet users, they fail to point out 730 million Chinese have no Internet access. The Epoch Times reports that this group consists largely of residents of rural and small and mid-size urban areas and a mobile population of up to 230 million people, including migrant workers. According to The Epoch Times, this large group of 750 million people who either do not have access to or do not know how to use the Internet, represent the ideal audience for shortwave broadcasts. Free Media Online applauds the decision of Sound to Hope Radio to increase broadcasts to China. At the same time, we deplore the decisions taken by the Broadcasting Board of Governors to terminate or sharply reduce on-the-air radio broadcasts to China, Russia, and other countries ruled by authoritarian and totalitarian regimes. “We believe that members of Congress and the American public are being grossly mislead by BBG officials who time after time have shown their inability to understand market research in closed societies and the desperation of people living under authoritarian and totalitarian regimes. Their decision to cut VOA radio broadcasts to Russia has resulted in over 80% drop in audience reach and they have shown their inability to expand Internet audience just as they could not protect VOA websites from a successful Iranian cyber attack last week. Members of Congress and American taxpayers should demand from BBG officials to explain why they want to eliminate radio broadcasts by the Voice of America, which has more listeners in China than Radio Free Asia and BBC; why they want to ignore 750 million Chinese; and what they plan to do during any future Tienanmem event in China when the regime in Beijing will completely block or censor the Internet at the most convenient time for them and the most inconvenient time for the U.S. government and pro-democracy supporters in China,” said Free Media Online president Ted Lipien. He was a former BBG manager and until 2006 former acting associate director of the Voice of America. Americans for U.S. International Broadcasting, a group of current and former VOA and BBG employees and free media advocates, have started a petition driveÂ to convince Congress to reject the BBG’s and the Obama Administration’s proposals for eliminating shortwave radio broadcasts to China. This letter is to request your strong support to restore the budget for Voice of America Cantonese Service and Voice of America Mandarin Service in the FY 2012 Budget. We object to the proposal by the Broadcasting Board of Governors (BBG), which serves to manage Voice of America (VOA), to eliminate the entire VOA Cantonese Service, as well as eliminate the positions of more than half of the VOA Mandarin Service staff members. This egregious effort to disappropriate funding from VOA will effectively eliminate the purpose of the Congressionally mandated Public Law 94-350 to the people in China who speak Cantonese and Mandarin to be provided with news broadcasts that promote freedom and democracy. This target against Voice of America â€“ right on the heels of PRC President Hu Jintaoâ€™s recent visit to the United States â€“ is nothing less than a concession that will dismantle Americaâ€™s commitment to broadcast news from the United States. During the same time of this funding cutback, the PRC intends to spend more than a billion dollars to enhance their propaganda goals in the United States. This campaign against Voice of America comes during the PRCâ€™s media crackdown on stories against Nobel Peace Prize Laureate Liu Xiaobo. It comes during a time when PRCâ€™s media has blocked news about uprisings in Egypt and Libya. It comes during a PRC crackdown against any stories shared about the blind lawyer Chen Guangcheng, and all prisoners of conscience in China. We implore you to restore the FY 2012 Budget funding for the Voice of Americaâ€™s Mandarin and Cantonese Services so Voice of America can continue to fulfill its mandate to provide a balanced and comprehensive view of significant American thought and institutions; and to clearly present the policies of the United States to the people of China. No user commented in " Sound of Hope Radio Plans to Expand Uncensored Shortwave News Broadcasts to China While Voice of America Retreats "